A Satisfactory rating requires clear and effective communication with appropriate use of teaching resources. My strength as a communicator comes from my willingness to explain things to students multiple ways, using multiple approaches, and integrating discussion and experimentation wherever it is needed. 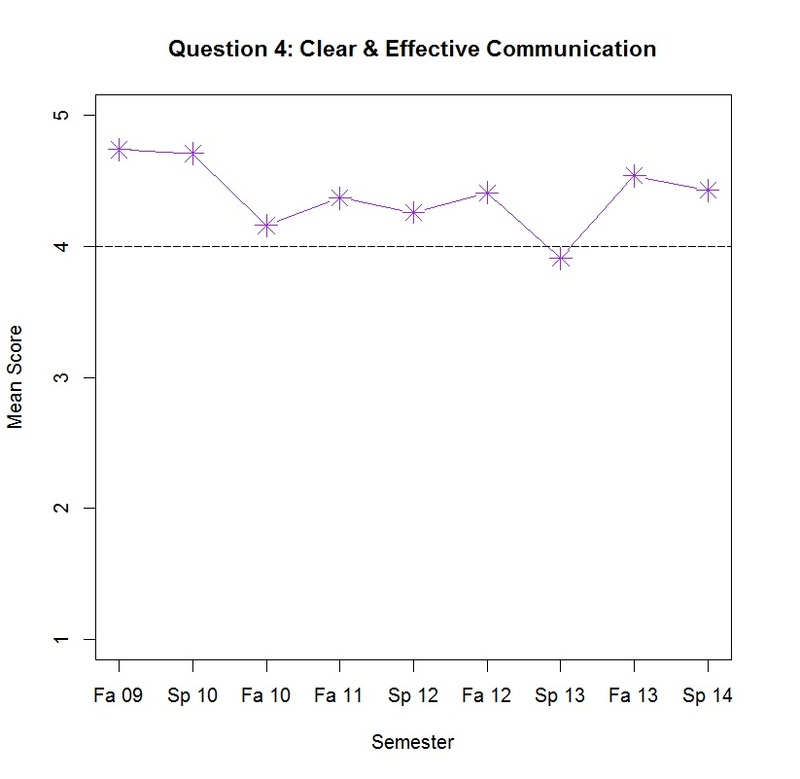 Evidence of clear and effective communication is provided by selected examples of teaching materials, above average responses from Question #4 on course evaluations (instructor speaks clearly and stresses important points) and extremely positive comments received by students on course evaluations. Selected Examples of Teaching Materials – Most of my teaching is activity-based and results from completing tutorials and lab exercises, and applying concepts learned in the labs to data that the students choose or collect themselves. I have created teaching materials that explain simple concepts (such as how to prepare and interpret Pareto charts), moderately difficult concepts (such as how to compare the effectiveness of classifiers), and very difficult concepts (like how to create a multilayer feedforward neural network that can be used to classify handwritten images). Sometimes my materials are based on code I have written, and sometimes they are based on code that has been prepared (but not explained) by other academics and practitioners. I also guide students as they prepare materials for future students in my future classes, for example, coding a simple Discrete Event Simulation in Java or learning basic Monte Carlo simulation with the @RISK package. Course Evaluations – My scores on Question #4 are consistently high and exceed departmental averages. Most recently, student evaluations were 4.54 in Fall 2013 (compared to a departmental mean of 4.38) and 4.43 in Spring 2014 (compared to a departmental mean of 4.38). The figure below shows that my ratings have been consistently at or above the “Agree” level since starting at JMU, marked by the dashed horizontal line. The slight downtrend can be attributed to the addition of more advanced upper level courses, and more complex topics within each of those advanced courses, as I have continually improved my course content and restructured my course delivery.